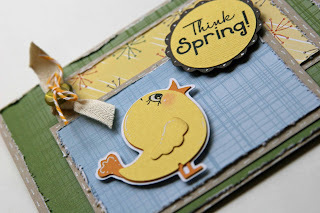 Liz's Paper Loft: Think Spring Card and a GIVE AWAY! Think Spring Card and a GIVE AWAY! If you are looking for The Scrapbooking Queen's Royal Court Blog Hop, click here there is still time to be in the drawing for Nikki Sivils paper! I'm so ready for spring! It feels like it's been storming forever and it's not suppose to quit til next week! 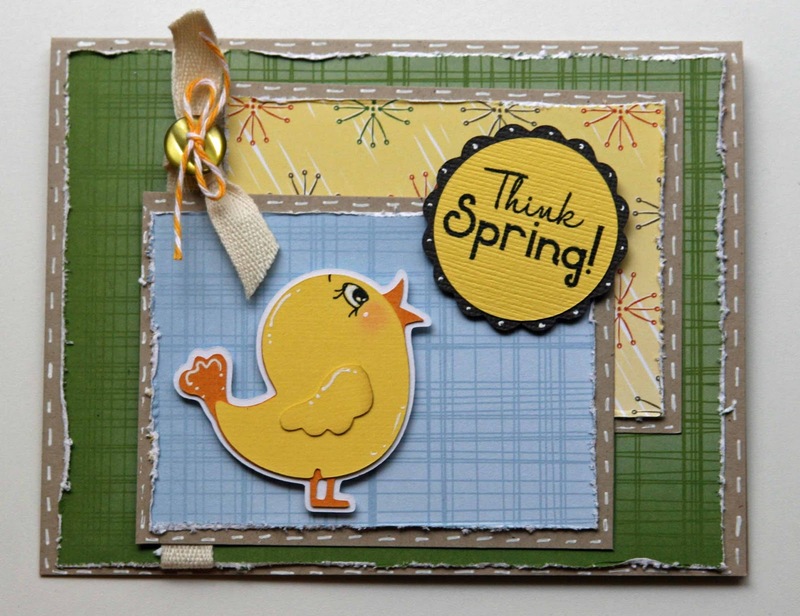 So I thought I needed to make a card for spring! And of course since The Scrapbooking Queen's Royal Court is featuring Nikki Sivils Scrapbooker products, I used her paper! 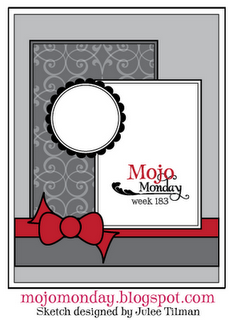 I also used Mojo Monday Sketch #183 for my layout! Want some of Nikki's paper for your own? Leave one comment each day that I feature Nikki Sivils Scrapbooker, I will be picking 2 winners at the end of the week! And check out Nikki Sivils Facebook, "like" it and let her know that I sent you, let me know that you did for a bonus entry! You can also click here for Scrappy Moms Stamps Terrific Tuesday Challenge to win a set of stamps! This card is so cute! And I love that paper! I never knew there was a chick on Cherry Limeade...you learn something new everyday! :) Thanks for the chance! 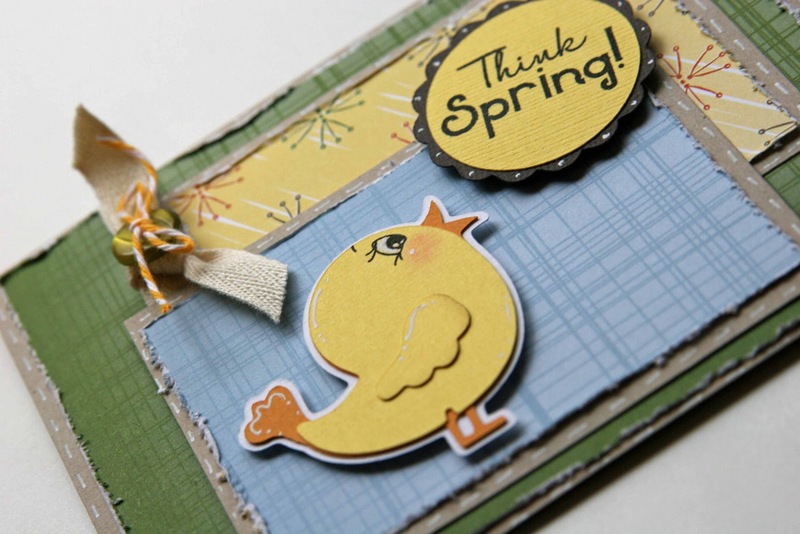 Such a cute card and perfect with the My Friend Birdie paper and the cut from Cherry Limeade together! I just love the little birdie, wish I had that cart! The Nikki paper is so cute too. I love the bird! So cute!! So adorable! I already like her the other day and told her you sent me! The paper is really nice! Adorable! I'm definitely thinking spring here! Oh Liz! I love your stlye! This chick is so cute! In fact, it makes me wnat to run out get that cartridge just for the cute little chick! I'm crossing my fingers and toes. Hoping to win this fabulous paper! Thank you, Liz! I needed that card, as this huge storm is bearing down on us. :-) Seriously, this is so cute. I really love how you distressed your paper. Perfect! Really cute Liz! I love that little chick! I had no idea that he was on that cart... I am going to have to look at it again. That is adorable!! I'm sure ready for spring to!! It's frezzin here! i went over and liked Nikki's facebook page, I love her products!! thanks for the chance to win! Love the chick and color combo! This is soooo cute!! Love the paper!! She has some great products, thanks so much for the chance to win. love the "torn look" and the use of a template. I think this is my favorite card on your blog yet! TFS! Super cute card. TFS and for the chance to win! 0824jejeasics gel noosa tri 10 navy L'économie difficile s'est chaussure nike air max 2017 bleu avérée difficile pour de nombreuses entreprises Stockport, et même des acheter nike air pegasus 92 entreprises à travers le Grand Manchester. En réalité, les basket nike air jordan 8 retro junior tarifs et les coûts des accessoires Hiphop air jordan pas cher en soldes Put sont généralement liés à la mode, au design, au chaussures nike homme ete matériau, à la qualité, au confort, au luxe basket nike air presto 2017 et à plusieurs autres aspects. Ils pourraient éventuellement être nike air jordan 6 retro utilisés pour traiter les maladies vénériennes lorsqu'ils air jordan femme rose pas cher sont administrés à l'état frais, lorsqu'une teinture fabriquée asics femme course à partir d'eux est généralement utilisée comme sédatif, anesthésique et vulnéraire. I'm a Guest Designer at Emma's My Creative Time! Nikki Sivils Scrapbooker Paper Winners! First Love Card ~ Last Day of My Give Away! Knotts Berry Sweet! Nikki Sivils Give Away! The Queen's Royal Court Blog Hop! Kassidy's Polka Dot Blog Hop! Home is Where the Heart is Blog Hop! I'm now part of the the Royal Court! Scrappy Moms Stamps and EAD Designs Together! Scrappy Moms Stamps Terrific Tuesday Challenge! EAD Designs Monday Hop and Give Away! Announcing EAD & Paper Smooches!